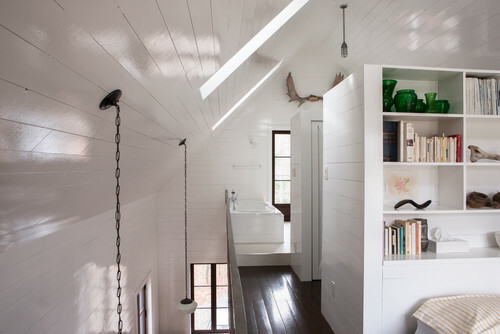 Most homes have a few gloomy rooms and nooks, but you don’t have to stay in the dark. To illuminate a poorly lit home without flicking a single light switch, use a combination of these bright ideas to enjoy an improved result that’s like the difference between night and day. Choose glass-paneled doors. One of the most effective ways to let natural light flood into your home is to use glass-paneled doors. Installing a new window or increasing its size usually requires a permit, but this may not be the case when replacing exterior doors. 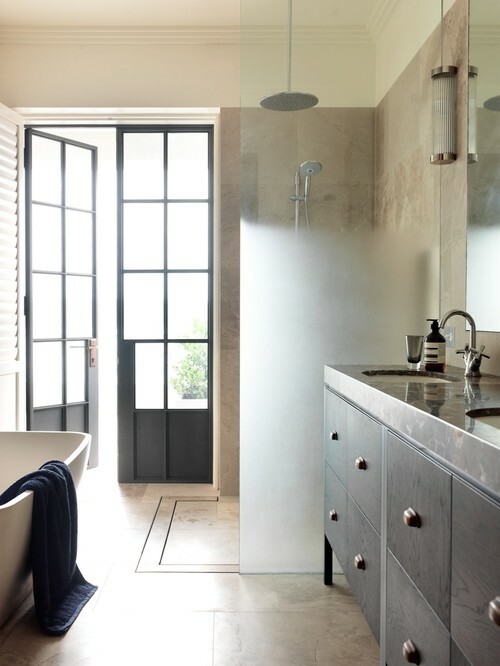 Whether you like the bold lines of these steel-framed doors or prefer the traditional French doors in the next photo, there is a design to suit every palette and position, both inside and out. Tip: If privacy is a concern, opt for frosted glass. Use transom and sidelight windows. This Sydney home uses a sophisticated series of interior French doors to borrow light from adjacent rooms. Designed by Luigi Rosselli Architects and Decus Interiors, the transom windows (which crown the tops of the French doors) and the sidelight windows (which flank the opening) more than double the aperture and maximize the amount of light that travels from room to room. Sidelights, transoms and fanlights (which also sit above doorways and are arched or elliptical) can usually be retrofitted with relative ease. Adopt glass backsplashes. Can’t afford to lose valuable cabinet space by replacing your wall-mounted kitchen cabinets with a window? 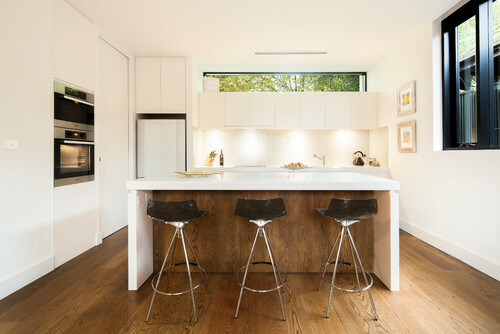 Try using a window for your backsplash instead, as Rudolfsson Alliker Associates Architects did in this residence in Sydney. 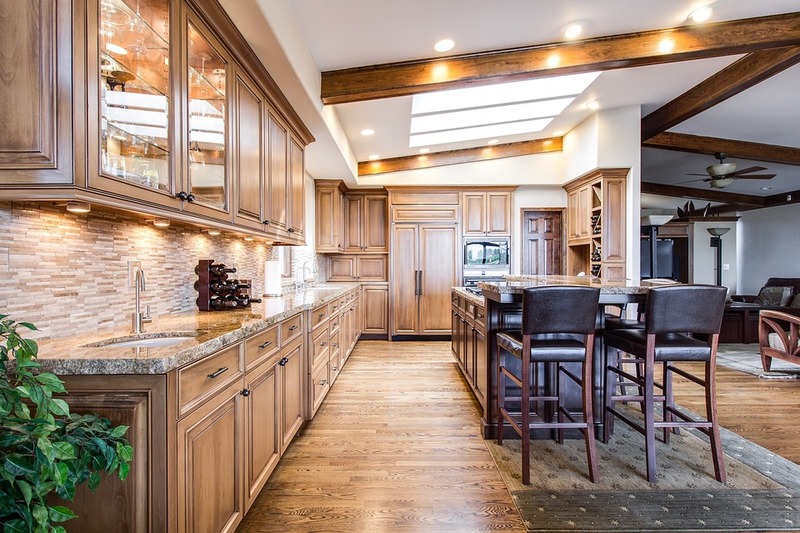 Natural light will illuminate your countertops and provide important task lighting for cooking. Window backsplashes are possible when your kitchen butts up against an exterior wall. If yours runs along an interior wall, try using a mirrored backsplash instead. Install clerestory windows. We can’t always puncture a wall with a window at eye level, but clerestory windows can be equally effective in brightening up interiors. 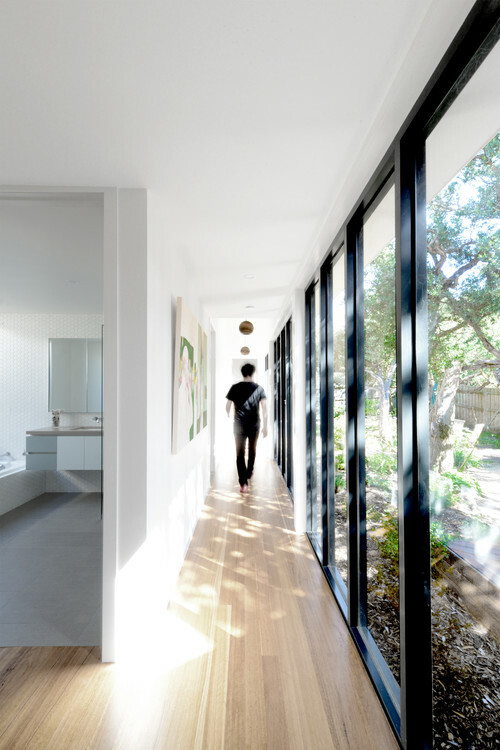 Clerestory windows sit high in your wall, as shown in this house in Melbourne, Australia, and because they are positioned above your sightline, they rarely compromise your privacy. They are also especially effective in letting light into dim, excavated rooms. Select white paint that has a sheen. If you’ve asked anyone how to brighten up a dark home, chances are you’ve already been told to paint your walls white and banish dark furnishings. While this is the first trick in the book, the glossier the paint is, the better it will diffuse light throughout your home. So opt for a satin finish on walls and use gloss or semigloss paint for the trim. Just note that paints with a medium to high sheen highlight every inconsistency, so make sure that you plaster, sand and prime surfaces well before painting — or call in a professional. 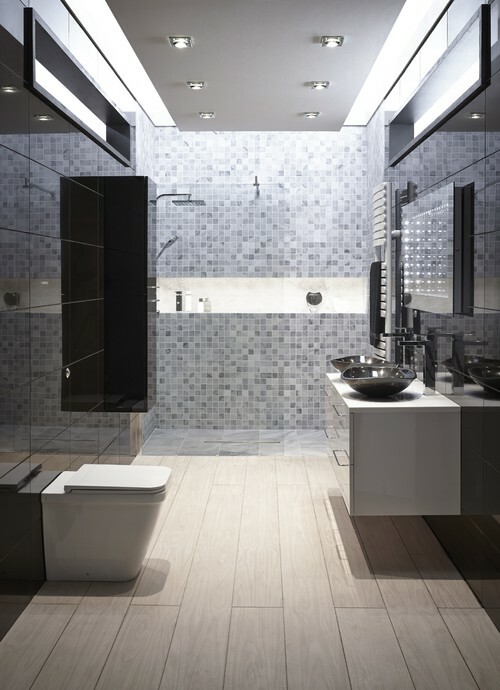 Tip: Reflective tiles and metallic wallpaper have a similar effect. Embrace glossy floors. We rarely consider treating our floors to lighten a room, though high-gloss floors are brilliant at bouncing light around. It may be as straightforward as sanding back your floorboards and polishing them with a glossy finish, or you may prefer to employ a more drastic treatment and use high-sheen white floor paint or epoxy, as used in this industrial Montreal penthouse. Install a tubular daylighting device. These ingenious inventions go by many names —tubular daylighting devices, solar tubes, sun tunnels, tubular skylights. 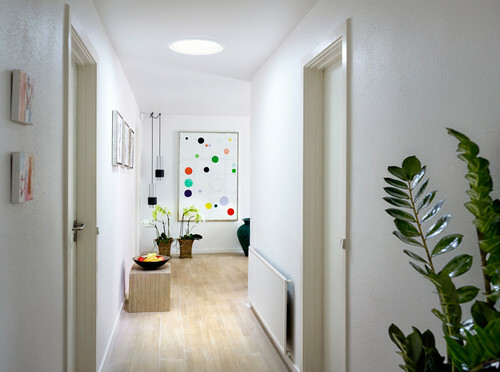 Most capture sunlight through a small dome on your roof and funnel it down a reflective tube and through a skylight-like opening in your ceiling, which diffuses light throughout the room. These devices amplify natural light, do not cause homes to heat up and in some cases are capable of capturing solar energy to light rooms at night. Most can even be installed in rooms with no direct roof access, using angled reflective tubing to channel light into hard-to-reach spaces. Create an atrium. The sheer elegance of atriums is enough of a reason to try to incorporate one into any design. 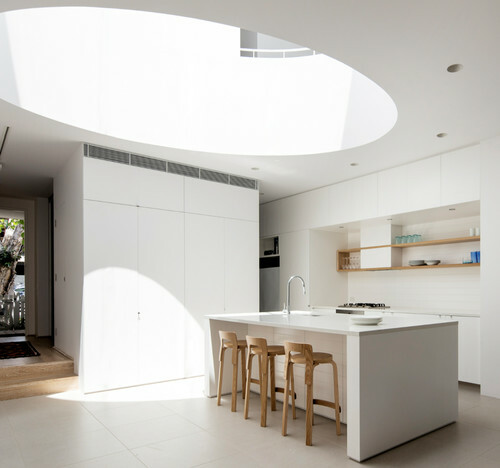 This circular skylight designed by Decus Interiors channels sunlight down to the ground-level kitchen, while natural light pours into the upstairs rooms via interior windows that overlook the void. One of the best features about a large round skylight is the exquisite light play and shadows that transverse your interior over the course of a day. Break through the ceiling. 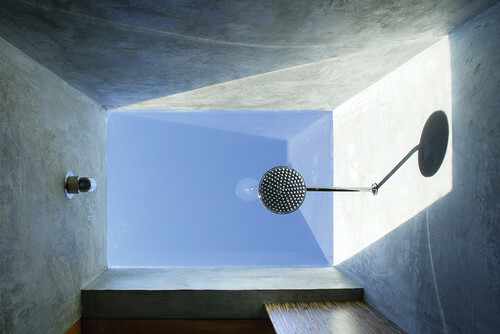 What better way to wake up than to gaze at the sky during your morning shower? Besides letting natural light pour into a room, skylights have an uplifting effect and can be used in most places with direct roof access. 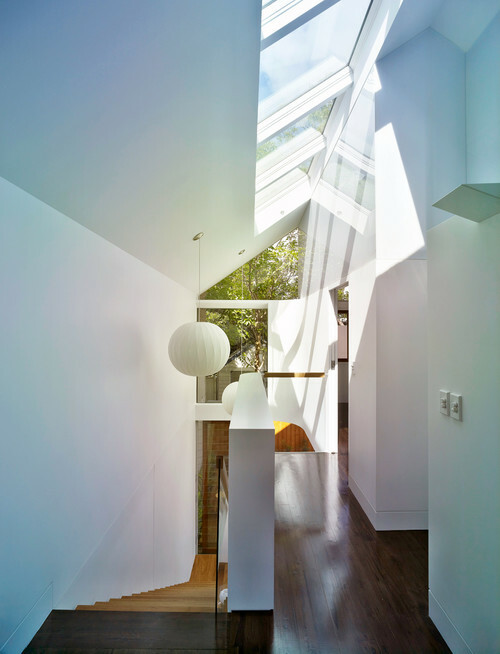 Gable skylights like the ones in this Sydney home by Christopher Polly Architect can be cleverly angled to suit the aspect of your site. Many skylights and roof windows now use self-cleaning glass. This usually has a specially formulated exterior coating that reacts with ultraviolet sunlight to break down leaves and debris that fall on the glass. Rain then finishes the job by washing the panes clean. Tip: Skylights can trap heat inside homes, so increase your ventilation to counter this. Consider exterior glass walls. For sites where privacy is not an issue, using floor-to-ceiling windows instead of walls will flood your interiors with light. Opt for double panes (at least) for insulation, and try to position your wall-to-wall windows facing north. Excessive glass on the western and even eastern sides of your home often lets harsh, hot rays inside and can overheat your house. If you would like to install floor-to-ceiling windows but are concerned that this may sacrifice your privacy, there are many inventive screening options that may still make it possible to enjoy exterior glass walls and some seclusion too. Swap walls for room dividers. Sometimes there is no alternative to walls for structural or screening reasons. However, if you want to delineate a space rather than divide it and create a solid barrier for privacy, consider using a room divider instead. Room dividers come in countless creative forms, including glass blocks and laser-cut screens, so the only limits are your imagination and site restrictions. 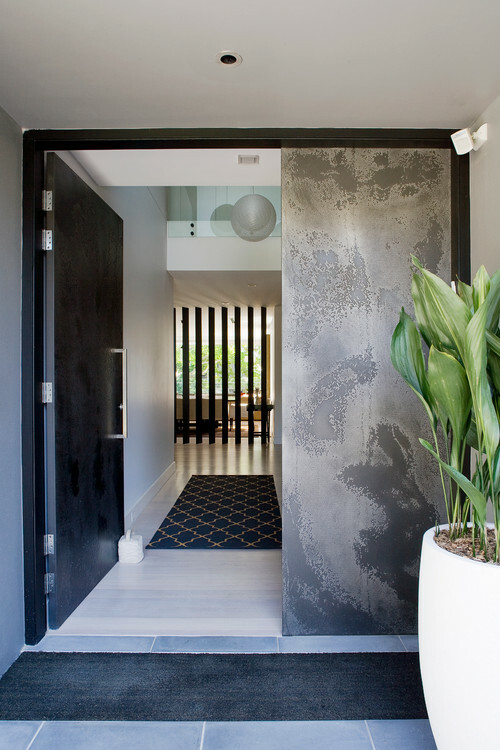 See the vertical black room divider in this Sydney home from Denai Kulcsar Interiors? This design borrows natural light from the windows beyond, which then penetrates the entrance. 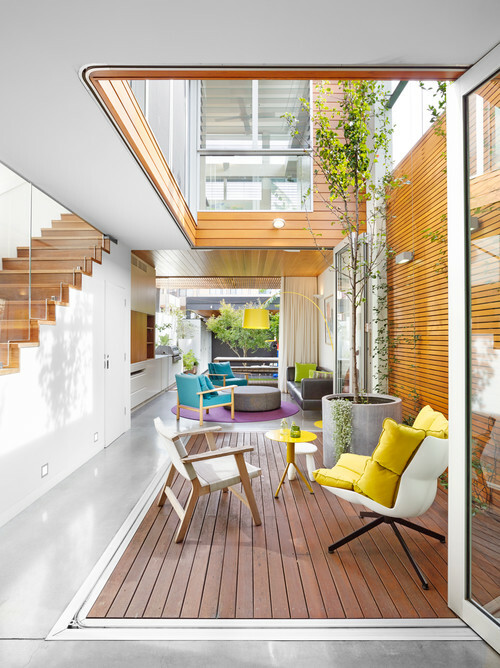 Carve out an interior courtyard. Do you have the budget for renovations and some space to sacrifice? A central courtyard could naturally light your home from within, which is the case with this Sydney home by Elaine Richardson Architect. These tranquil indoor-outdoor spaces are best surrounded by windows, glass louvers or glass sliding doors to let light shine from the courtyard into adjacent rooms. Consult an architect, an interior designer or a builder for advice on how to maximize light penetration on your site, and remember that even a small interior courtyard can make a big difference. Hang a mirror on the wall. We’ve all heard that mirrors can transform any space from gloomy to glamorous, but there are a few tricks. First, bigger is always better when using mirrors — the larger the reflective surface, the more light it will bounce around the room. And second, your mirror needs to reflect a light source, so place it opposite or adjacent to a window, as was done with the oversize circular mirror in this San Francisco home. Hanging a mirror behind a lamp can brighten a room even further. 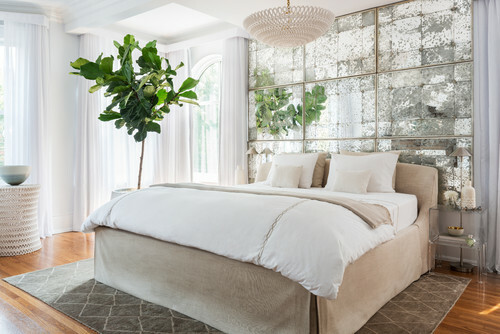 This mirrored wall sports an antique finish that is reflective (and large) enough to brighten up this Toronto bedroom, but textured enough not to mirror your every move. 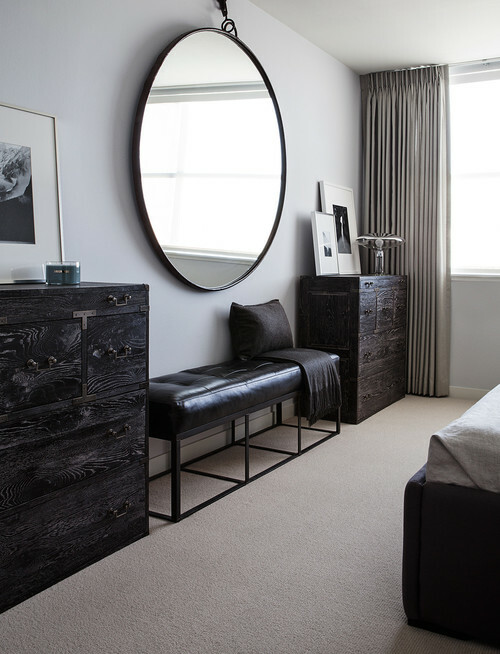 Tip: Mirrored furniture, such as a chest of drawers, can also have the same effect. Use illuminated LED mirrors. Illuminated mirrors are like their regular relatives but on steroids. Thanks to LED technology, these clever inventions mirror your reflection and simultaneously light up the room. Models like the one in this photo have motion sensors that allow you to switch them on and off, hands-free. As a bonus, the LED lighting consumes less power than many traditional light sources.